124 a/c pressure switch operation? My a/c compressor isn't engaging. I've jumpered the terminals at the Klima module and got the compressor to engage. I checked the continuity between the two spade terminals of the pressure switch near the drier and have found an open circuit through the switch. Is this normal or is this an indication of low refrigerant pressure? You'll not get any Joy. when you jumper the LPS wires ,It's the LPS that needs renewing. The Open Circuit on the LPS is just telling you there's not enough pressure. Klima relay HAS been known to screw with more than one MB owner. 1. 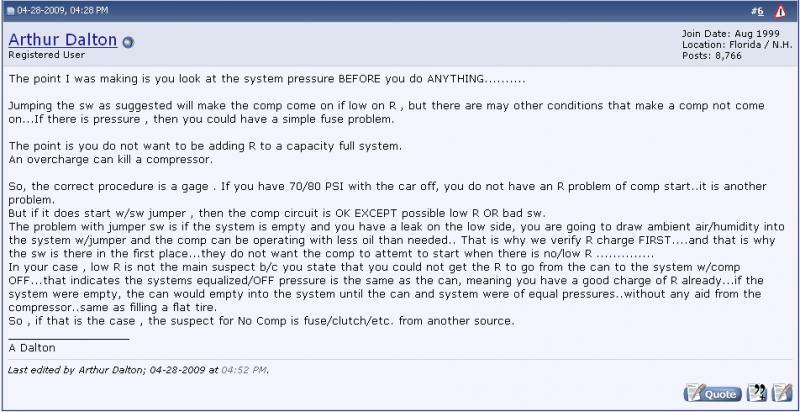 Check for proper freon level/pressure, correct as necessary. 2. Try "Jumpering" the LPS. 3. Then look askance @ the Klima. Last edited by compress ignite; 12-31-2010 at 07:25 PM. Since I don't have access to guages at the moment I will jump the switch as a test. IS ,whether or not EVERYTHING else in the circuit/CCU system is working. ('Cause you're "Forcing" the System to engage the Compressor,by "Telling"
Is there a way to test the Klima relay? I will check for 70-80psi with compressor off and proceed from there. "The biggest challenge in the diagnostic process is the extreme intermittent nature of failures in this system. The system consists of two controllers: The pushbutton controller (PBC), located in the console; and the compressor control relay under the hood (called Base Module, Klima or MAS, depending on the model and year -see photos). These two controllers have very different mission statements. The pushbutton controller is concerned with temperature control as it relates to occupant comfort. It controls the compressor clutch for evaporator temperature and humidity during defrost conditions. It also sends a control signal to the compressor control relay whose mission is to control the compressor to meet the engine's needs. The compressor control relay monitors the engine speed vs. compressor speed to protect the belt system from a locked compressor. It disengages to protect an overheating engine and to provide extra power in diesel models, and may possibly disengage to protect a low or erratic idling motor or an under-voltage system. The first place to start in this diagnosis is to decide which controller is disengaging during the event. The easy access is at the low/high pressure switch on the drier. The signal from the pushbutton controller passes through the switch to the compressor control relay. This is a ground signal in most, but not all, cases. Verify the signal when the system works, then monitor the signal to determine which controller drops out. Pushbutton control problems usually are just that. In early units, the controllers had internal connection problems, bad solder joints and poor connections between the temperature wheel and switches to the PC board. Occasionally, there are evaporator sensor problems and control often goes astray when the aspirator pump won?t pull air over the ambient air temperature sensor due to pump or tubing problems. The inside controls have self-diagnostics on later versions starting in 1990. These diagnostics can be read with an impulse counter or LED on models up to 1994. The code is read by initiating self-diagnostics, which is done by grounding the appropriate system pin on the diagnostic socket for two-four seconds. The code can be read by monitoring the pin with an LED powered by the battery. The diagnostic pin will be grounded for a number of flashes to transmit the code (Code 4 = four flashes, etc.). After reading all codes, they can be erased by rereading and then grounding of the diagnostic pin for six to eight seconds. Each code is to be read and erased until Code 1 is reached. Code 1 indicates no faults. This method of self-diagnostics can be read on any system (with self-diagnostics) up to when the systems went digital beginning in 1995, depending on the system." I remember when climate control systems used cables connected to flaps. When you wanted it warmer you moved the lever to the red and if you wanted it colder you moved it to the blue. If that didn't work it was most often a clamp at the cable that came loose and had to be tightened. That's my "Dream State" to wake up and find some Genie has retrofitted my W124 With MANUAL HVAC controls! The Information in this Tome is INCREDIBLE !